Successfully Added 2-DIN Car Media Player + GPS + Bluetooth with 7 Inch Touchscreen to your Shopping Cart. 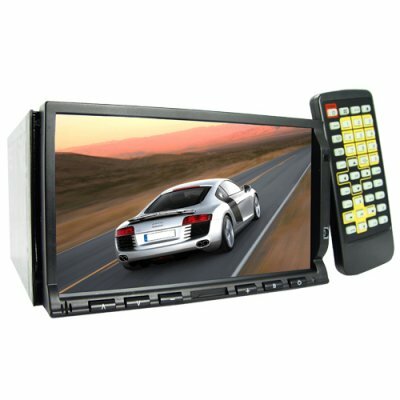 Double DIN car DVD player, modern handsfree Bluetooth and entertainment center with extra large 7 inch widescreen (16:9) LCD and GPS navigation system. We are happy to offer you another great GPS car multimedia system from our new 2009 collection. This model includes the win CE 5.0 environment necessary to run all of todays popular GPS software packages and includes a magnet base GPS antenna with extra long cable so you can place the antenna anywhere on your car you wish. The CVEJY-701T-GPS has a dedicated GPS SD card slot and includes an SD card with evaluation software - when you install the unit we recommend that you purchase a GPS software package from your home country that best covers your region of the world. While this unit makes for a great navigation unit, there is a lot more to this model than just the GPS navigation system. It has a responsive 7" touch screen allowing easy use as a Bluetooth and media interface, features compatibility with a wide selection of disc and digital media formats as well as a built in TV tuner, includes a rear view camera input, and frontside mini-USB and SD card ports. Combining an excellent design anf the latest in entertainment technology this new car multimedia center is a great upgrade for any vehicle and lifestyle (salesman or soccer mom). A great wholesale price makes this unit perfect for the resale market, VAR and OEM market, or simple personal/company use. As always, it is only available from your source for wholesale direct from China electronic products, Chinavasion. Car touchscreen DVD + multimedia player with beautiful 7 inch display. GPS navigation system ready to run all of todays popular GPS software. Can play MP3 and MP4 files from disc (cd-r), USB, SD card, or even files from your iPod or other portable MP3 players. Primary Function: Vehicle multimedia player and GPS system with beautiful 7 inch display. Note: **Compatible with Tomtom, Route66, iGo, Navigator, Destinator, Nav N Go, Finean, etc.